[Edited out] suddenly god has appeared and Gam PEraliya borrowed from Martin Wickramsinghe and now thrashing his own cabinet the best way to score points. Earlier Tamils were used to kill Tamils. Now Politicians bash politicians to score points. Why Welikada and Bogambara do not have more respectable people than these ? Make railways an essential service and if they strike interdict them. to station. Can be done. Get the military involved. They have the skills and the discipline. Railways will fall in line soon enough. And the others who dare strike will think again. I don’t want your name but agree with your idea in principle. Sri Lankan military maintaining its size at the same level as war times is over staffed and is ruining the chances of reconciliation in the north by taking over civilian opportunities by running farms to tourist industries, from trade to construction. Investment will not flow towards business ventures as they cannot compete with the military as the military payroll and housing is paid by state and a private investor cannot be competitive. This creates a good opportunity for the state to cross train the military in areas where its designated as essential services and if unions want to hold govt and people hostage run those services using the military. Clean the mess before the next election. Privatize higher education, create essential services where industries have a direct impact on the economy and people and use the military in all parts of the country, not just the North and East. Oh really? Spineless, only! What about, the balls? Most do not have balls too, and the speaker is one, no as I understand it? Did you check it if you have them ? You are a post doc researcher but to fall on to that level ? What i s behind your rantings Thrisu ? Again an another MONGOOSE episode too ? Did we have better speakers ? Did we have democracy seen in pervious MUGABE style cabinet ? In today s context, evey cent to be saved in many ways, even if some naive decisions were seen among them too at the begning ? But do they have gigantic boarded entourages as had been the case with LANKEN Suhartho ? From what end you vee been bubbling Thrisu an another to have sought GREENER pasturers in UK ? Hope your PHD students would not get misled !!!!!!!!!!!!!!! Lanken Richmondian is fallen to all levels akin that of Wimal Ponnawansha. What about it? Do tell! However, in this case, I raise my hat to Magala for speaking his mind. Senaratna & Amunugama may have doctorates but I wonder if they plagiarised their thesis because they do not seem to understand the anomaly created by favouring a selection of those in Govt. service for a pay rise. Of course, playing to the gallery is an art developed by those in politics from SWRD to Premadasa but if Mangala stands his ground on this issue, I will have some regard for him, even though he didn’t have the guts to stand up to what he believed in as in the case of the death penalty. Mangala was the only one in the cabinet who vociferously spoke out against the death penalty, Raj. And, what he said made absolute sense. Because there are skeletons in the cabinet. When capital punishment was a hot topic (now freezing cold), Mangala said that he is against but has to take collective responsibility. His comments here on the cabinet (if taken literally) is a contradiction. You cannot have the cake and eat it Mangala. Spine less Cabinet only because of its leader the President is spineless. President has given too much of room to GMOA who are today acting like thugs and the President sits idle without teaching these thugs a lesson. Similarly “Pinata Seat” MPs he brought into the Parliament who were kicked out by the people are today challenging the President and he does not replace them. Every time a Yahapalana Minister makes a progressive move, the President instructs to reverse it. During the last Provincial Council campaign without attacking Mahinda Rajapakse he went an attacked the same person who brought him in as the President. When the head is so weak even the tail goes in between the legs. This may be one of the few instances where the observations of the Minister of Finance were over-ruled. By and large it has a tremendous power and mandarins in the Finance Ministry abuse the virtual power at times but in other instances provide very sensible observations. This outburst and its publication speak volumes. One can point out to him as to whether he means that the cabinets where he served under Jarapassa are much better in this respect than now. Yes! At that time, the Minister of Finance was the big man himself and this was also an inspiration to move the 19th amendment to the constituion. The comedy was that proposals that he himself signs as the Minister of Defense is opposed by himself in his observations as the Minister of Finance. In this particular issue the decision to be taken by the Cabinet is difficult and it has to be appreciated by all concerned, mostly by the Ministers themselves. Both the instances of ad-hoc salary increases and crippling rail strikes must be avoided, an instance where one must have the cake and eat it as well. So! Decide and Ministers must respect the collective decision. How can Rajitha promise our Tax Money to his buddies in Unions,when we have entrusted Mangalan to look after it. Although Dr Ranil let his mates swindle the Treasury, when the best Finance Minister was in charge. Has Mangalan Lost the respect of the Cabinet because Mangalan didn’t deliver his promise to get that USD 4 Billion from Suren to help the Yahapalanaya. I mean Yahapalanaya promised to fulfill its undertakings with that Cash backing.from the Diaspora…. USD 4 Billion is half of what Dr Ranil got from the Chinese for 15,000 Acres of our Land and the Harbour. That is 12% increase in just 3 Years of Yahapalanaya. Now poor Mangalan has to carry the can. What surprises me is the fact that Mangalam and you are descendants of Kallathonies from South India yet Mangalam sounds sophisticated than you are act dignified. Why are you both asymmetrical from each other? Speak for your Self and Mangalan Please…..
No I am speaking for you and your fellow Kallthonies. By now your grand father would have shared his family secrets with you which should confirm what I have been saying to you for donkeys years. Each minister can not make such demands . It’s true that many workers do have concerns.. Yet; this is not a way to deal with .. Cabinet should have a system to do it .. The money MR and co stolen would have been much enough to pay all this ..
Not only the Cabinet has no spine, our citizens have no brain. This is the third time that railway staff are going on strike in the past 1 year. And in the previous 2 times the government gave in to their demands, no minding the already out of proportion salaries that are given to them. 1. How is this going to play out? Howmany more times are they going to arm twist the government, at the expense of the convenience of the commuters? 2. What is Rajitha’s and Amunugama’s concern in all of this. For heavens sake Rajitha has his portfolio to face and the same goes for Aminu gamage. 3. Amunugama’s daughters TV channel Derana is PRO Mara, which makes it obvious that they are doing and will go to any length to discredit and cause confushion within the government. 4. What answer will the government have for other workers when they too demand for their pay hikes by crippling the country with strikes. After all everyone needs to be treated equally, not just the railway staff. 5. Upon all the commuters the trains carry each day, railway department doesn’t make any profit. This goes to show that the railway department is not efficient. That problem has to be sorted out first. An engine Driver is paid in excess of 250,000 rupees per month take home. The train Driver business goes from father to son so it is a select few that dominate the job. 6. Don’t other workers in other trades count? Don’t they too deserve pay raises just as railway staff are asking for? 7. What is the minister of transport saying in all this? 8. Railway unions must be controlled, they cannot be allowed to hold the commuters to ransom at their fancy. 9. Why should Rajitha be allowed to interfere into everything? After all the SOB was not even able to get a PET Scanner for the Maharagama Cancer Hospital on his own. It took the kindness of one Mr. Mohamed to raise the money through donations, yet during the commissioning of the scanner Rajitha was shamelessly leading the opening parade. 10. Rajitha goes to Singapore for treatment! Yet he tries to fix railway problems that is not under his purview??? 11. Why do people forget everything so easily and why don’t they citizens reason with a clear mind? 12. Mangala is right. He is always right. The cabinet must be more objective in their ways. We need more people like him. We are missing good leaders like JR, RP , Lalith, Gamini, ranjan Wijeratne, Denzil Kobbekaduwa, Wijaya Wimalaratne. The kind of thoughts are very common in SL. I think in a country leaders can emerge in any time. I think UNP has good leaders today than the opposite SLFP bunch. UPFA has been ruined after their get together. Lankens in general believe, when leaders die, others would not be capable of doing what is left behind. There are .. but there are also some groups belonging ot Mahinda Rajakashes has been looting the nation. Mahinda though is said to be educated, is no different to that of Wimal WEERAWNSE by his evasive talktive reponses being added to the VOICE cuts. Today, good leaders have no space to expand their horizon since the media men are only at widening the images of ALL abusive men. What I see wrong is the MEDIA mafia prevailing in the country. How is Wijaya Wimalaratne a good leader ? I know one of his brothers. Wijaya Wimalaratne lost his life to LTTE and does it make him a leader ? worker welfare or patriotism . Trade Unions are like land mines in our country. NOT ONE PARTY ISSUE ! AT LEAST SPEAK 50 % OF THE TRUTH . If politicians stop serving themselves with luxury cars and other perks, if they stop robbing the people…………..trust me people will not revolt and ask or make undue demands. Parliament must demonstrate that they practice austerity before imposing it on other people. What is the point of being principled when he is unable to deliver on his promises, the stolen $18 billion he was going to bring back from abroad, independent war crime investigation he promised, De-militarization of The North, ……………………. ? 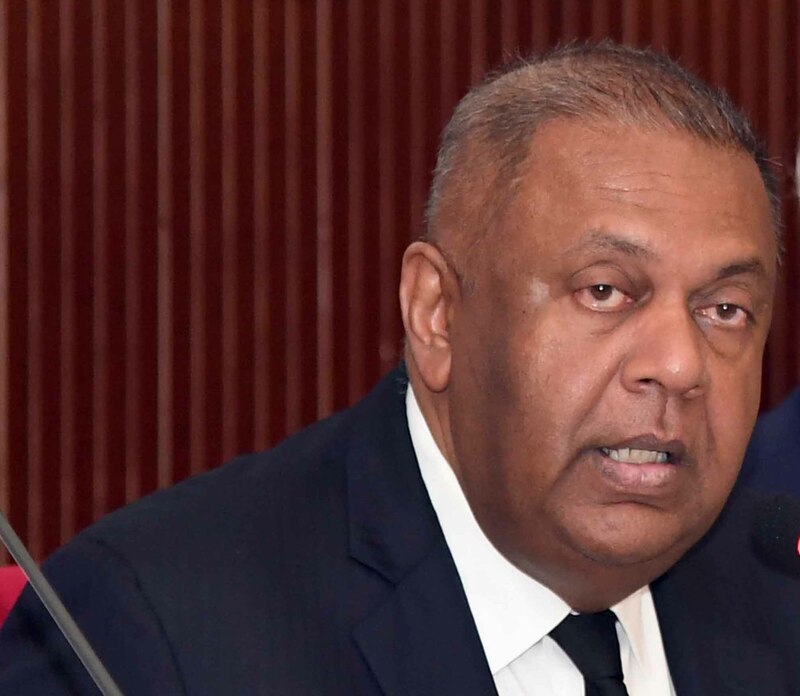 MAngala Samaraweera – Sri lanka’s MCC Representative after preparing ther Country for take over by foreign companies, now says those tthose Two National List Ministers make the cabinet spineless. On the othe rhand, Ranil says, I am not the American agent now, it is Mangala. We hear you we hear you Mangala. ‘Most Spineless’ implies all cabinets are spineless. The MPs must ask the mirror “Do I have a spine”. Good many will be told “You have had a spine transplant waiting to be rejected. Book Singapore straight away. Do not forget the Doha side visit”. What happened to so called Mangala’s spine, when he gave his observation for giving allowance to SLAS one month ago? The problem is that any strong criticism on Mangala, CT won’t publish. Why? mangala isright.Giving into strikers is no good.Wrong message is sent to other worker.however if they have some legitimate grievences it should be looked into.